Shopee, the leading e-commerce platform in Southeast Asia and Taiwan, launches the Shopee 2.2 Double Double Sale from Jan. 26 to Feb. 2, featuring twice the savings for Filipino users. “We launched Shopee 2.2 Double Double Sale to kick off the second month of 2019 on a high by providing our users with twice the savings and fun. We have worked closely with brands, sellers, and partners to deliver even more unbeatable deals on Filipinos’ favorite categories and brands. In addition, we have also invited top Filipino stars on Shopee Quiz, to bring users even closer to their favorite celebrities. We are very excited to launch our first big sale of the year and we welcome everyone to join us for Shopee 2.2 Double Double Sale,” said Martin Yu, Associate Director, Shopee Philippines. Back-to-back themed days every 24 hours starting Jan. 26. Users can watch out for 2.2 Flash Sale Day on Jan. 26 with 9 rounds of flash sales; and 2.2 Vouchers Sale on January 30 offering countless vouchers from a wide range of categories and brands. 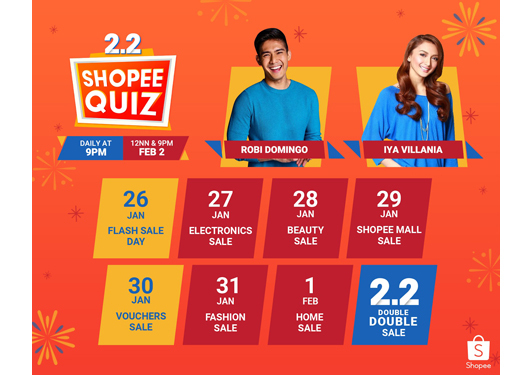 Daily sessions of Shopee Quiz at 9 p.m., with an additional session on Feb. 2 at 12 noon promising an upsized pool of Shopee coins.